Over the past few months, we have focused our efforts on bringing you coverage of the more attractive video cards but, more often than not, those video cards come coupled with a rather hefty price tag too. Today, we are moving away from the norm and bringing you a real world evaluation of all things less than £100. 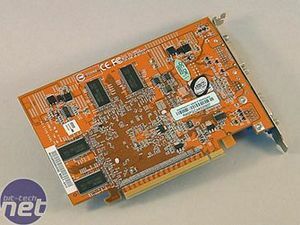 The card that we are looking at today is ABIT’s RX600 Pro-Guru 256MB, which we will come to in due course. 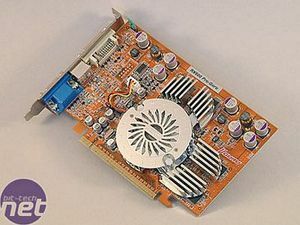 These days, there are many options in the under £100 PCI-Express video card sector, so it is worth having a quick look at what is on offer before we delve in to ABIT’s X600 Pro implementation. There is the ‘bottom of the bottom’ price bracket that starts at around £50, which contains ATI’s Radeon X300 series and NVIDIA’s GeForce 6200 series, more specifically the GeForce 6200 with TurboCache. Moving further up the scale, we have ATI’s Radeon X600 series and the lower portion of the GeForce 6600 series, namely the 128MB GeForce 6600, which can be bought for around £80-90. Funnily enough, the Radeon X300 series and Radeon X600 series use the same basic GPU configuration, the only difference being the manufacturing process being used. The Radeon X600 series use the RV380 core, which is based on TSMC’s 130nm manufacturing process technology, while the Radeon X300 series uses the RV370 core, based on TSMC’s 110nm process. Both cores are essentially the same, featuring four fragment pipelines and two vertex shaders – the only difference between the two different product lines is basically the clock speed they operate at. It could well be possible to increase the clock speed on a Radeon X300 to simulate the performance of a typical Radeon X600, for example. ABIT’s RX600 Pro-Guru is a rather interesting innovation, as it features a technology that resides from their motherboard range. Many of you may, or may not know about ABIT’s µGuru technology, it is a technology that was introduced on its top end motherboards around 12 months ago. For those who haven’t read much about it, there is a very useful page on ABIT’s website that explains how µGuru technology works. Seeing as the technology resides from ABIT’s mainboard, it is worth a quick summary of what µGuru technology brought to its motherboards before delving in to what it brings to their video card line up. In essence, µGuru allows you to manipulate various motherboard settings that would normally only be accessible from the system BIOS menu. It achieves this with a piece of Windows software that interfaces with the µGuru chip located on the motherboard. The software also acts as a hardware monitoring system too, allowing you to monitor your motherboard’s health. µGuru technology for motherboards contains six applications: ABIT Audio EQ, ABIT BlackBox, ABIT EQ, FanEQ, FlashMenu and OCGuru. Some of these applets are ported over to the video card version of µGuru, which incidentally, was named vGuru, so that the two technologies could not be confused. At the introduction of this technology, ABIT launched two video cards featuring the technology, namely the RX300 SE-Guru and RX600 Pro-Guru – the latter is the video card we are evaluating here. 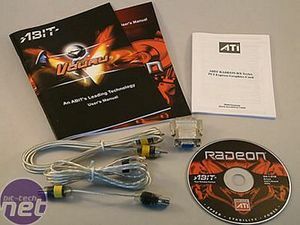 As already mentioned, some, but not all of µGuru’s applets were transferred over to ABIT’s video cards for vGuru technology; ABIT BlackBox, FanEQ and OCGuru are the applets that remain – they are accessible from inside Windows via the software that can be found on the CD included in the box. You can also download the latest version of the software from ABIT’s website. There is a small jumper on the video card that is located near the connections from the PCB to the DVI port. This changes the mode that the video card is operating in – with vGuru; there are two modes, Normal mode, and XTurbo mode. There are two small LEDs, one red one green, next to the jumper. 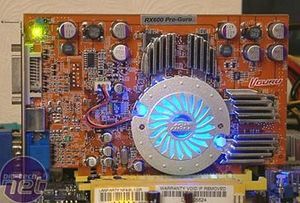 When the video card is operating in Normal mode, the green LED is illuminated; when the card is running in XTurbo mode, the red LED is illuminated. You have to turn the system off to switch between modes, but you are unlikely to want to change modes while using the system anyway. 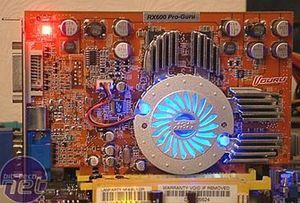 When operating the video card in Normal mode, the GPU core and memory run at 405MHz and 514MHz (DDR) respectively; in XTurbo mode, the core clocks are increased to 500MHz by default – the memory clocks remain the same, though. The heatsink is a very different design than what we are used to. The fan is covered by an ABIT-branded faceplate, while the base of the heatsink, is chromed. The base is constructed in aluminium and is attached to the memory modules on the front of the video card. The fan is quiet and emits a blue glow that looks quite funky in the dark. The heatsink design does bring something to my attention though – this particular sample is fine, but we must mention that we have a slight reservation about the design of the base of the heatsink. If the base was slightly curved or deformed, and was to slip through ABIT’s quality control, there could be cause for concern – there might well be heat-related issues residing from a poor contact with the GPU core due to a curved base. We’re sure that ABIT’s quality control system works to of a very high standard, but the design does give me a slight worry in that respect. The back of the card has another four TSOP memory chips; they’re 4.0ns chips and thus, are rated to 500MHz. This means that the chips are already running faster than they are specified to, as they are running at 514MHz DDR to start with. We don’t expect great things from the memory when we overclock the video card later, but with the aid of vGuru, we might be pleasantly surprised. The bundle is pretty good when you consider that this card retails for under £90 – it’s not designed to be a card for the serious gamer, so you can’t expect oodles of games included. There is an S-Video to Component adapter, RCA Composite cable and an S-Video cable included, along with the standard DVI to VGA converter. Incidentally, there are three manuals included: a quick installation guide, a user’s manual and a second user’s manual that focuses entirely on vGuru technology. The CD contains the vGuru software suite, along with drivers – we still recommend updating to the latest version of the Catalyst display drivers though, as there are monthly updates including both bug fixes and performance improvements.